The Box Moor Trust is a charitable organisation dedicated to the maintenance and upkeep of open spaces in the stunning Hertfordshire countryside. So when the time came to update and restore their historic Education Centre, they wanted a design that would marry old and new elements to create something new, something visually striking and brilliantly functional. 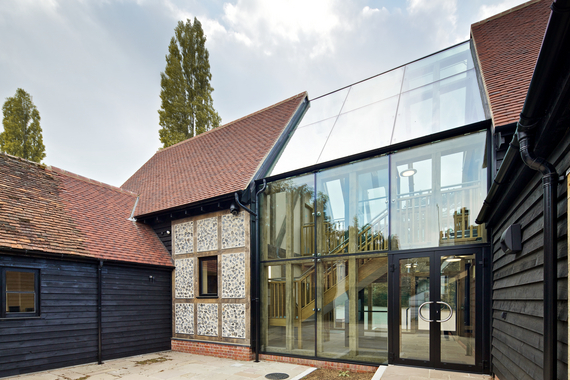 The existing structure was small but perfectly formed – a one-time barn that had been remodelled in keeping with the local area and using local building techniques. Built with a low-brick plinth wall at the base, timber-clad and featuring a clay-tiled pitched roof, its one drawback was that it had very few windows. As part of a planned revamp, The Trust wanted to find ways of adding not just more space but more light to the Centre too. Tasked with expanding the original building, the architect’s main aim was to create a more modern structure – a light, airy space where visitors and staff could relax and make the most of their inspiring surroundings. two-storey atrium, joining two previously stand-alone buildings. Offering unrivalled stability and safety, the toughened product enables architects to construct entire structures out of glass; offering a high level of flexibility and helping create an attractive working environment. In this case it was the perfect way to create a large area without compromising on light or space. 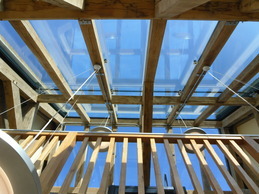 Pilkington Suncool™ was used as the outer pane of the insulating glass units (IGUs) for its excellent solar control and thermal insulation properties with clear heat-strengthened Pilkington Optifloat™ and toughened Pilkington Optifloat™ used for the inner panes of the IGUS on both the roof and walls respectively. The end result is a stunning two-storey atrium that blends seamlessly into the countryside around it and offers an inviting prospect to any approaching guests. For more information on Pilkington Optifloat™ and Pilkington Planar™ check out our product pages.